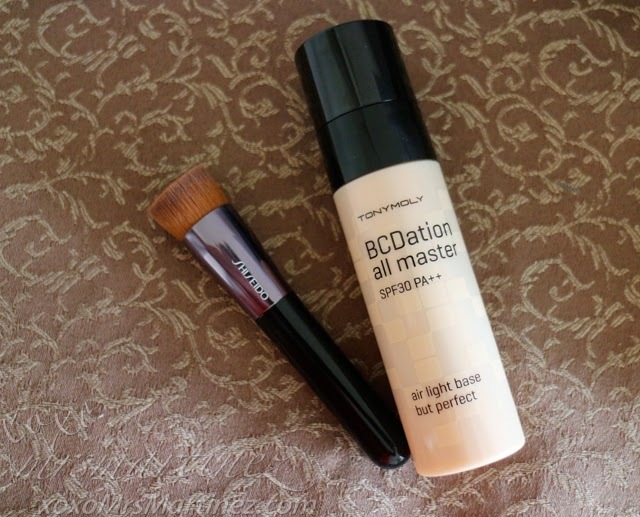 I got this new and improved BCDation All Master SPF 30 PA++ by Tony Moly after Christmas. Unfortunately, I was not able to bring it with me when my family and I went to Singapore. Anyway, I finally had the chance to test it yesterday. 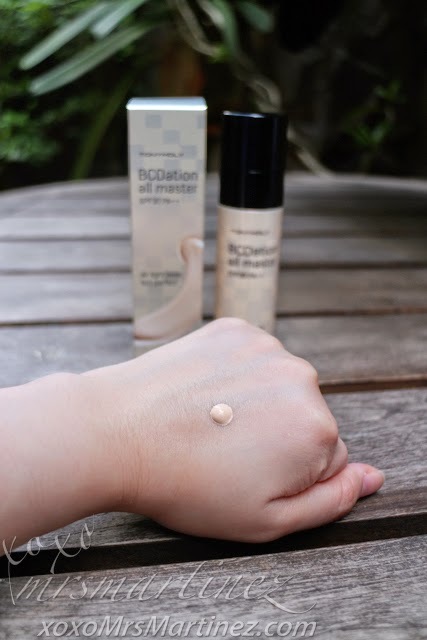 According to the box, BCDation is a BB Cream, CC Cream and a Foundation in one. The new formula is now added with three ampoule capsule that conceals fine line, thus promoting youthful glow (bet ko yan!) Its formulation contains 45% nourishing serum base which covers skin imperfections with a porcelain-like finish. Did you know that BCDation All Master is clinically approved by Korea Dermatology Research Institiute as a safe and effective non -invasive option to face lifting and wrinkle removal? Tony Moly BCDation All Master has a yellow/beige undertone. At first pump, I thought that the color was not a match for my skin tone and complexion. I was afraid that it will be too light (ghoulish...yikes!) or too yellowish on me. 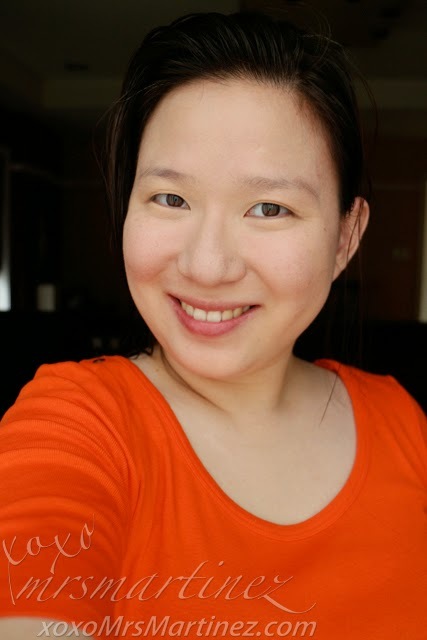 But as you can see in the photo (taken under natural light), the product blended well with my skin tone. Always check if the color of your neck matches the color of your face. 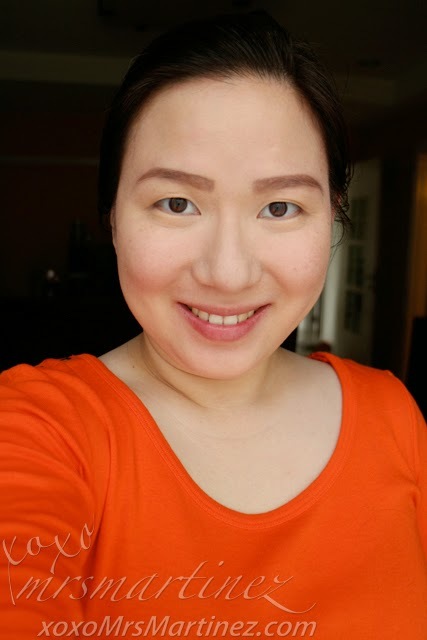 Using Shiseido's Perfect Foundation Brush For All Formulas (see photo number 2), I blended the makeup product outwards. Please avoid tugging the skin of your face, it may result to uneven application, or worst, a sagging skin... ack! I have a dry skin condition so after application I can still see the pores and some sunspots on my face huhu The only solution that I can think of is to apply a little powder over it. 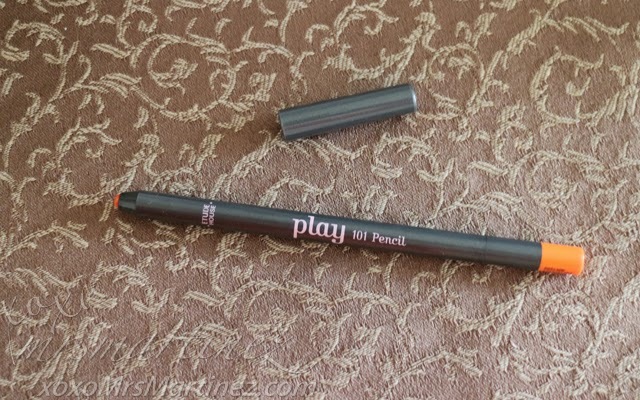 But I like the coverage- not too light and not too heavy, great for everyday application. 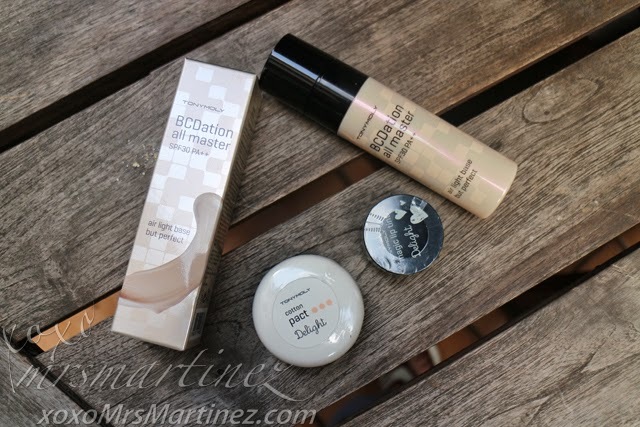 It is safe to say that it offers medium coverage, in between a BB Cream and a CC Cream. Downside? It only comes in one shade. 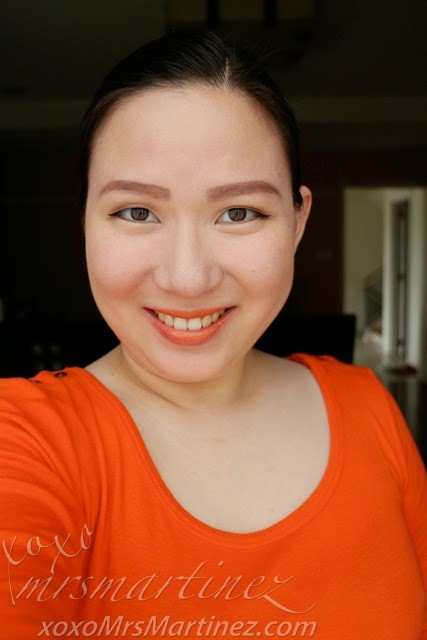 To complete the look, I used my current favorite Inglot Freedom System Rainbow Eye Shadow 112R and makeup brushes from Charm for my eye makeup. Still don't know how to draw or fill your eyebrows? You can view the step-by-step eyebrow tutorial here. Grooming your eyebrows once a week or twice a month makes it easier for you to draw the outline. 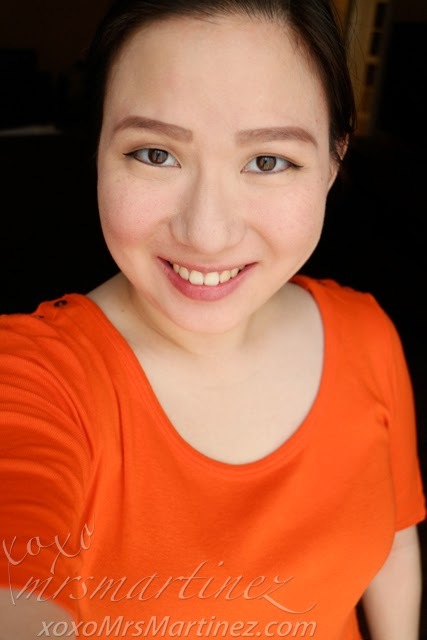 If you are a first-timer, I suggest you visit a reputable salon that offers eyebrow threading. After a single session or two, all you have to do is follow the natural shape of your brows. 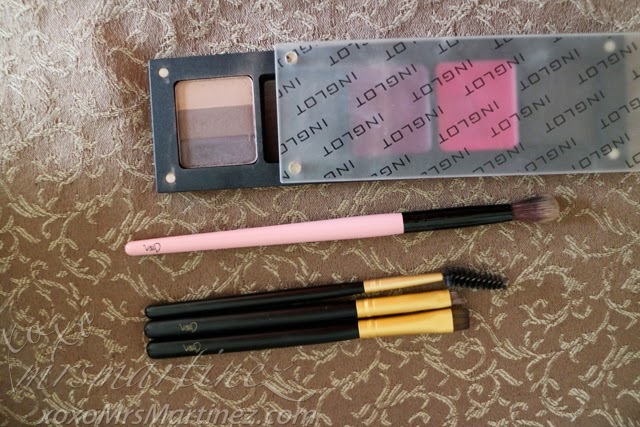 I also used Inglot Freedom System Rainbow Eye Shadow 112R as my eyeshadow. I used the lightest shade as my base and the one at the center for the outer corner of my eyelid (see 6th photo). 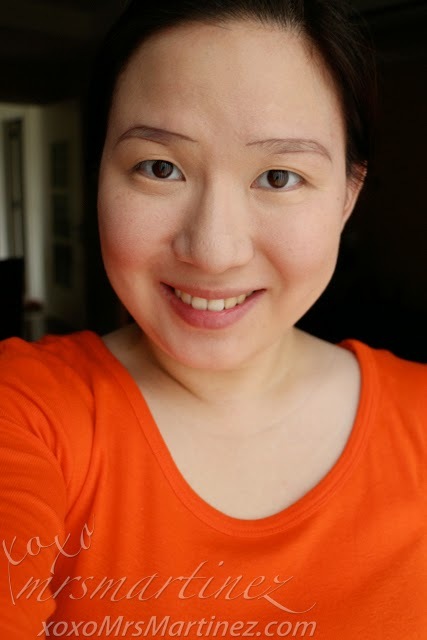 As a finishing touch, I applied my newly bought Etude House Play 101 Pencil #13 on my lips. 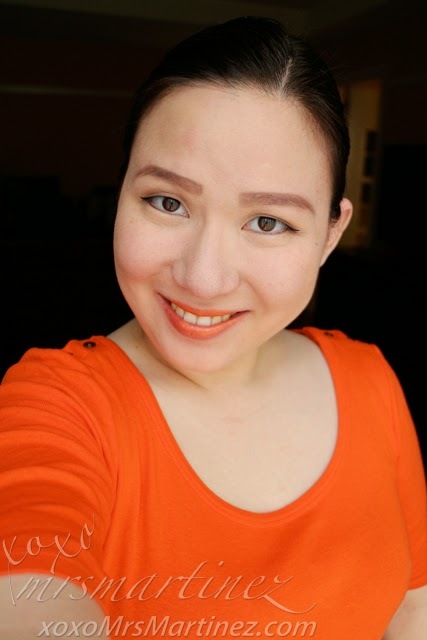 I love how it matches my orange blouse hehe More on that in my next entry. Here are the other Tony Moly beauty products that I got- Delight Magic Lip Tint and Delight Cotton Pact. I should have used Tony Moly Delight Cotton Pact after applying BCDation All Master because it minimizes the pores. It is also light on the skin and delicately controls sebum production. It gives you a semi-matte finish. Among its listed ingredients are Hawaiian deep sea water, 4 varieties of mild sprout extracts, white clay and cotton seed extract. It is available in two shades No.1 Clear (Bright Oil Paper Pact) and No. 2 Beige (Natural Oil Paper Pact). The Delight Magic Lip Tint is a smart multipurpose balm and tint that transforms like magic on your lips. This tint will help you achieve the my-lips-but-better look plus it can keep your lips moisturized over the day. It is available in four variants- Strawberry, Red Berry, Pink Berry and Green Apple.